These cemetery inscriptions were copied by Mr. Gary C. Atchinson, of Loon Lake, Washington, during the summer of 1980. He reported, "This cemetery lies on a hillside. There is a road that winds to the top. I was told there was a fire which burned down the wooden markers. 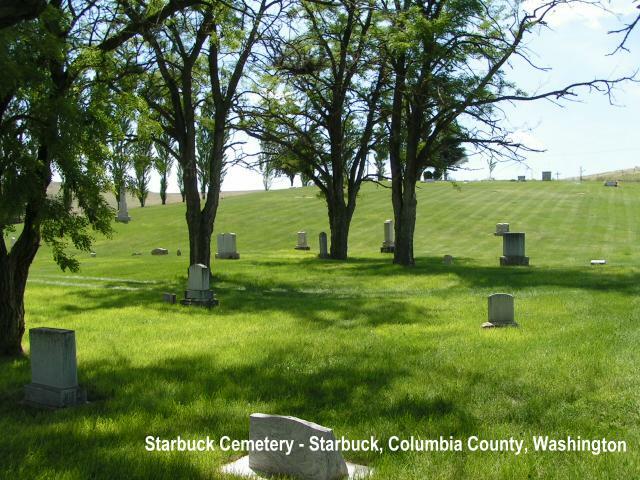 The cemetery is fenced and the weeds were mowed down when I was there, in the summer of 1980." The graveswere apparently recorded as they were located row by row starting at the top of the hill; therefore, those persons with question marks (indicating no surname) may be from the family on either side of that grave. The listing here, was edited and retyped by Jeanne Polumsky Coe, July 2012, from the Eastern Washington Genealgoical Society BULLETIN of June 1981.